The readout noise is the basic noise that you get with each shot, independent of brightness or exposure. As explained in the theory, an exposure series can be used to isolate the noise readout in each image and splitting it into conversion gain and readout noise. What could possibly ruin the measurement? Make sure you are still operating in the linear range of the sensor (not too dark and not too bright). Otherwise the amount of light will not correspond to the pixel count and the measured photon noise will not be the square root of the amount of light. The images must not contain a bias/offset, because that would contribute to the brightness, but not to the noise. The image brightness must be homogeneous, otherwise the standard deviation will not be the square root of the mean. The mean of the images to be subtracted must be about equal, otherwise the brightness difference will contribute a constant offset independent of the brightness to the standard deviation and the squared standard deviation will not be linear any more. If you are unable to get images of equal brightness, multiply one image to have the same mean as the other image before subtraction. An exposure series would show jumps in the data, if any. If you are certain there won't be any, two images per exposure time value suffice to calculate the noise from them as square root of the standard deviation of the image differences. From experience, I recommend 8–10 exposure time values. The more, the better to get an accurate result. If you are satisfied with a rough estimation, fewer values suffice. This is the noise of a MT9M001 sensor with its 10 bits encoded in the MSBs of 16 bits. The diagram shows the squared noise is indeed linear to the brightness. 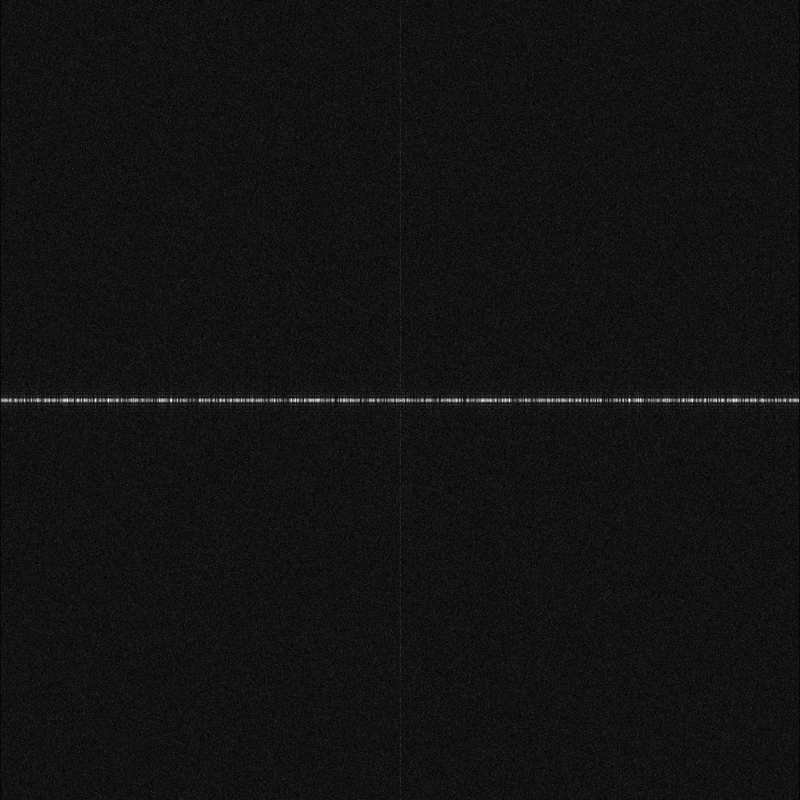 At zero brightness, the squared noise is 1237 DN, so the readout noise is 35.2 DN. The slope is 0.48 e- per DN, so we have around 17 e- noise. The noise in DN tells very obvious what the impact on a specific image is, but DN depend on the sensor gain settings and pixel encoding. The noise in e- is independent of that, but rather hard to imagine. 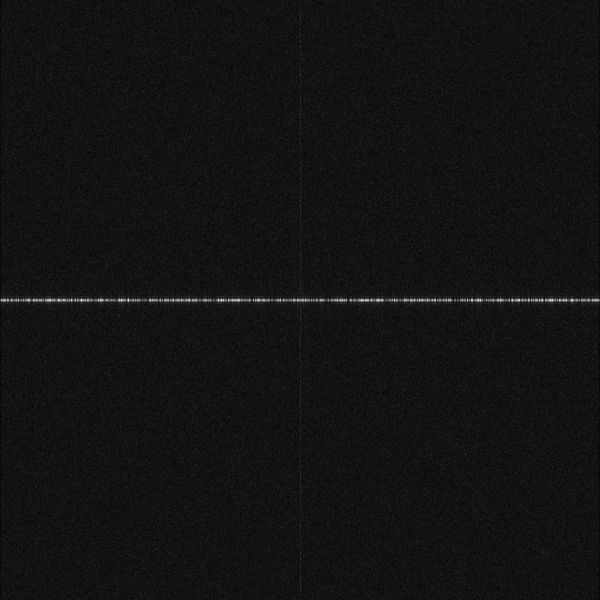 It is always a good idea to run a 2D FFT of a noise image to see the noise structure. The image below is typical for many CMOS sensors: Much column noise (horizontal bar) and some row noise (thin vertical bar). It would be bad if they would dominate the overall noise (background). In case there is shading towards the edges, it is likely that a high frequency filter is active and you are not looking at the raw pixel values. A bright ball in the middle would likely indicate a gradient or other low frequency error in the setup.